The wait for this episode was not nearly as painful as I thought it would be. I am thankful to being so busy this last week, time just flew by. We left off with the mom showing up which I hope they pick right up with this episode. Though a tiny rewind to see the Moms happenings 24 hours before getting to that door would also be nice. We open with Woo-jin getting home and hurrying to the door just as sister/Umma politely asks Seori who she is. Both Woo-jin and Yoo Chan run up to the gate. But aunt is a little mistaken with Seori, she thinks she is the helper for the house. She actually is only here quickly because she has a layover at the airport. The two boys hustle Hyun-jung inside then Yoo Chan runs back out to talk to Seori. Woojin also tells Seori to worry about anything, he will take care of everything. He smiles in a comforting way and drags her inside the house. Seori is reluctant to go inside, especiall with Hyun-jung there. Inside, HJ thinks the house looks a little different, there is something a bit strange. Woo Chan tries to distract his mother but the mother turns her attention to Seori. Everyone thinks they are found out….but then umma addresses the dog in Seori’s hands. Is that Dukgu? He looks so alive and healthy. Chan is able to grab his mother and drag her upstairs to show her something which ends up being his little chicken. Downstairs, Seori thinks she knows Hyun-jung. Upstairs, Chan tells his mother that his heart gave birth to this little chicken (or something like that, lol). Mother thinks the place looks great and wants to go back downstairs. But Chan pulls her to the bed and makes hr sit so he can sleep on her lap. he might have fallen asleep right away. umma says that he is just like her, he can fall asleep where he lays his head he concerningly looks at his callussed hands and then goes downstairs. She tells Woo-jin that Chan is the same as always and fell asleep. Seori comes in with a tray of fruit and says they can eat it, but Woo-jin nervously tells his sister that they should go talk somewhere. Noona follows him and is a bit worried in how Woo-jin is acting. She tells him to tell noona everything. But he says that there is nothing to worry about, actually, I will not make you worry at all anymore. His sister playfully hits him and tells him that she was worried that he wanted to talk to her first. He smiles and asks her if he worries her that much? Then he talks about how he is good and happy to stay with Chan who is not a baby anymore and is actually very reliable. he has good friends as well. His friend looks 30 but is 19 and his other friend ~. he keeps talking, but Noona starts to think that thinks are strange, but only in her mind because she knows that he does not like people in his house. Woojin pulls her to the window and shows that it can be opened. Noona thinks it is the coolest thing and looks at her brother with a bit of dismay and thinks back to him as a kid. She smiles happily as she listens to him talk about how great things are. Meanwhile, Jennifer is sitting with the mysterious woman. Are you married? The woman says that she saw a student go in and out of the house. Jennifer says no. So the woman tells her that it is nice to see her like this anyway. Jennifer tells her that it is surprising, she thought that she would not like to see someone like her anymore. Jennifer is using Jongdaemal and is also speaking normally (not like a robot). Back at the house, Chan wakes up and runs downstairs. Umma says that everything is fine, she talked to his uncle. She has to go back to the airport now but she left her bag upstairs so she goes up to get it. Seori is upstairs and gives Hyun-jung something for her heel because it is rubbing on her shoes. Umma thanks her for that. They all walk outside to send Umma off. Umma tells Chan, that his goal is to win the national competition, Don’t think, feel! Go ahead and exercise. Chan hugs her and tells her that he loves hr so so so much. He will take care of mister Gong so say hi to appa. Umma and Woojin drive off, but then Seori runs after them. She tells Umma that she is sorry but she is not the helper, she lives there for free. She used to live there but to find her uncle she somehow was able to stay there, she will leave the house as quickly as possible. She tells Seori that she is Woojin’s sister and Chan’s mother for a long time, it seems like they want to protect you young lady so maybe there is a good reason. Goodbye. Chan is all like, huh, is that really it? The end? But umma kick and punches her son playfully and tells him that this is the end. then she tells him to practice hard. They leave again. Chan thinks his mom is super cool, perhaps he should have told her. Later on, WJ gets home to a concerned Seori who goes outside to see him. She asks how it went dropping his sister off. he tells her that actually, she changed her mind and wants her to leave. Seori is all like, oh…is that it, yeah, a strange woman is in the house, I would say the same thing. She walks to go pack but Woojin tells her that she does not have to pack, it was his joke. Also, why did you come out, you would have been okay for two hours. But Seori thinks it is not just two hours. We would have lied to her, she is your sister, the person I am the most thankful to and she is Chan’s mother, I did not want to do that to her. WJ looks at Seori very longingly. She asks him why he is looking at her that way. he tells her that he does not know, but he keeps looking at her like that. But then Chan walks up and sees them this way. he waits a beat and then interrupts their mood. What are you guys doing? His friends are also behind him and Jennifer shows up with watermelons, she will do all the cutting. Cut to them all inside eating watermelon and playing with the seeds on their faces and spitting them into bowls. Jennifer has a Galaxy note 9 and takes lots of photos of them with it. They all play with the phone. Woojin’s sister calls him to let him know that she is fine and also thanks him for letting her know about Seori first. Flashback to Woojin telling his sister int he car that Seori is not the maid, she is actually a woman that is staying with them. Then Seori runs to the car. Woojin thanks his sister for saying those things to Seori, his sister is all like, you like her don’t you? Of course woo-jin just responds with, huh? Later on that night, Chan wakes up and wonders where his uncle is. He walks around the dark house calling for Mr. Gong but accidentally stubs his toe and wakes up the house. jennifer and Seori both come out. Woo-jin left his phone at home, it is 4am and they don’t know where he is. Everyone is concerned with where he is. Perhaps they should call the police? But Jennifer says he is an adult man that is only gone for 3 hours, they will not take this seriously. Chan checks his closet and sees that his uncles luggage is still there. He is releaved to see that and says that this is a good sign. Sometimes he leaves suddenly and without notice and does not come back for years, but he left his luggage so it should be okay. Jennifer tells them that they should go about their day as normal. JH tells Hee-soo and Seori that he is really sorry about the fish thing so he will not go to the club for a month. He is really sorry about it. he thinks that Seori is worried about that which is why he brought it up. Hee-soo also tells her that she bought two of the same books instead of book one and book two. Seori apologizes and heads back to the store to return one. HS also wonders where Woo-jin is, why is he driving us crazy. She does not think he would just leave like that, he is not that irresponsible. Seori starts to walk tot he book store, but then sees Woojin waving his hand across the cross walk. She turns around and runs the other way. Woojin wonders why she is running the other way? He yells, did you see me? On teh other side Seori thinks that he made everyone worry, why is he coming back so happy? Yes, I did not see you! But he yells on the other side that they are not selling the house! We are not selling the house! But Seori just hugs him and thanks him. He is a bit stunned at first, but then he tells her that the house is not going anywhere and the tree with stay there as well. So you can find your uncle slowly. Also, am I invisible? Why did you pretend that you did not see me? She tells him that he did the thing that I am afraid of the most. You dissapeared and didn’t tell anyone. I thought he disappeared and I did not know where you went. I was so scared. He tells her that he will not do it again, he will not disappear ever. Chan gets a message on his phone and yells at his uncle. Where were you! We were worried! But then he gets filled in and happily tells him to go to work. He turns to his friends and tells them that they are not selling the house! Cut to Jeju island. Woojin visited his father suddenly to talk to him about the house. His father asked him why he did not want to sell the house. Woojin tells him that he started to like it, he wants to keep it with all it’s space and time and memory. Appa asks if he is going to leave the country for half a year? Woojin tells him that he will not do that anymore. Sorry for making you worry. He also tells Jennifer that he is not selling the house and he is sorry for making her worry as well. Dukgu is also happy. Later on, Seori is pouring herself a glass of water at work when Woojin comes back in. She thanks him again and then notices that his button is loose so she wants to fix it. Otherwise she will look stupid with a loose button. he reminds her that she tells him he is stupid sometimes but he is fine. She wants to fix it so seh grabs a needle and thread and gets to work. HS comes into the break room and interupts them. Seori is so stunned that she picks her head up with head butts Woojin right in the nose. Cut to Woojin with tissue up his nose and puffy eyes as the four of them sit at a meeting. HS cannot go to an island festival and wants Woojin to go there. But he has a meeting with an art gallery so he will come to work in the afternoon. She tells him that he came to work in the afternoon today and did not tell her ahead of time! he gets up to leave as if it is all gravy and mentions that he is going to the orchestral practice room to get a feeling of classical music. HS thinks Seori should go as well since she is a professional musician. Seori hops up to go with him and also apologizes for having a hard head. If her head was less hard then his nose would not have bled as much. But he tells her that it is cool. then he picks up his broken head phones and throws them away. HS sees it and looks completely shocked. The musicians are all practicing in the practice room when Woojin and Seori show up. Seori is happy to see TR and greets her, then she starts to take a lot of photos. But then the conductor comes in and recognizes Seori, he calls her name to the astonishment of Tae-rin. Seori runs up and apologizes to the conductor for taking photos and starts to run off, but then she stops and turns around. They both look at each other. Cut to Seori and the conductor talking. he tells her that he thought she recovered and went to Germany and was doing her music there. Seori timidly says she wishes that happened. He asks her if she played at the workshop? Seori says she was so bad, but the conductor says that her technique was good. She had her own interpretation of the music with her sounds and emotions. It was all there. Seori mentions that she would like to start over. he pulls out a photo from an album and asks her if seh remembers it. It was their first day of practice. She remembers it, it feels like it was not a long time ago at all to her. meanwhile, TR is pacing in the practice room. Woo-jin comes in and tells her that he left his tape measure. TR asks him if the person from his company is still with the conductor? he says they are still talking. TR looks uncomfortable with that and continues fretting over it. Woojin notices, but does not mention anything about it. Later on, another man is talking on the phone to someone. perhaps this guy is the overall director of the event? he sees Seori thanking the conductor and then leaving. It looks like he remembers her. he says she is the staff member from the designer. Seori tells Woojin over lunch that the conductor told her that she can use his practice room all the time. that is so daebak right! Not that long ago I knew no one, but now I know so many nice people around. She starts writing something so Woojin asks her what she is doing. She says that she is writing for a ddukboki event. He tells her that it won’t work, then he puts a picture in it and says that no one will take it (because her name was written so big on it). Woojin pays for the lunch and leaves, but Seori runs up to him and tell shimt hat seh wanted to pay for it. he tells her that she can pay for it next time. She grumbles about it, but he says that if she is sorry then she shuold give him his present (ah-juh). She pulls it out bashfully and says that she can buy a better one next time. he takes it and looks pretty touched to see that they are headphones. She says that she just did not want him to use broken ones. He thanks her and tells her that he will enjoy it. At home, he remembers the moment she fixed his button as he takes off his shirt. Chan comes in at that moment but Woojin does not even notice him. Chan is all like, hello, your beautiful nephew is here. They talk cutely with Chan telling him that he either forgot his dream and came for it or is giving Chan something like a dream (something cute). Woojin talks to a customer about a design but then gets a text about instant ddukbogi. Seori won the competition. He thinks that you never know what might happen. he goes back to work and asks where everyone is. JH tell s him that HS went to the island with Seori to see the performance. Woojin is prety bummed. They won’t be back until 9pm. Woojin thinks that he wants to tell her that seh won the event. He waits all day by his phone and gets so happy when it turns 7pm because that means they are on their ship. But then JH gets a call from them. they are not on the boat becuase there is a high wind alert, the event was cancelled also. HS calls Woojin and tells him that they are looking for a room due to the weather. Wookin gets home and sees Chan talking to someone (probably Seori) about the high wind alert. he won’t see her for a few days since he is leaving to train! Maybe I should pick you up! Chan hangs up just when Woojin wanted to talk to Seori. he goes usptais and tries to open the window, but he can’t do it. he wonders why nothing works. his cellphone goes off in his pocket, he tries to get it, but it is hard to come out an falls under his bed. So he hops down to get it but it is too far under to reach. Woojin tells the caller that he can hear them! I can hear you HS! But it is Seori’s voice that is talking. Woojin tells her that he can hear her! But then the phone cuts off. Woojin is able to get the phone with the plunger and returns the call, but it is turned off. Later, Woojin is beside himself with jitters at his desk and paints his fingernail instead of paiting the desk. he oly looks at the cell phone. Chan comes in and asks him why he is painting his finger nail? Can I borrow your power bank? Chan goes to get the power bank and sees the polaroid of Woojin and Seori with the phrase “Have a nice love life” written on it. His eyes turn sharp. In the kitchen, Jennifer thinks about the mystery woman. Seori and Hee-soo hang out at the island drinking beer in their room. Seori thinks the beer tastes so good, how is it this good? I never knew. HS asks if she is really thirty? How come you have so many firsts at 30? Seori is all like, yeah, I’m like that, I wanted to be cool like you when I was 30. Hee-soo is all like, huh, me? I don’t know anything, I just pretend like I know things. I just pretend like it. I don’t think any 30 year old lives like they are adults. But Seori says that ajusshi is really adult like. HS is all like Woojin? he is soooooo needy. Seori asked when they became friends. Hee-soo mentioned that he was the only Korean guy in their department in Germany so she just stuck with him. He could have been kind to me and explain things, but you know that he never listened, he was the same before. Seori wonders what kind of person he was like sometimes people never change. But Heesoo says that is not fully true, she met him after he changed once. Chan and his sister said that he was a very very smily guy, I don’t know what happened. Seori thinks back to Woojin telling her about what happened a long time ago on the beach. Hee-soo says that she never thought he would smile but after seeing him now, he is kind of like that. It is all thanks to you. But then Hee-soo says that she has to wash up. The cell phone is also all charged now so Soeri grabs it and wonders if she will wake Woojin up. Woojin is still awake and wonders if Seori is sleeping. they both look at their phones. Woojin thinks back to when he asks Seori if she has any music recommendations? She says, of course! Then she lists all these classical composers and their different styles. He tells her to just recommend something. She recommends furniture music. He is all like, what? Furniture music? Seori explains that there are some composures that make music that people call furniture music because you can listen to it comfortably. He listens to this song in Seoul as he thinks about Seori. She sits in her room as the rain falls and thinks about Woojin thanking her for her gift. Woojin is outside listening to her song recommendation while watching her tree. Woojin tells Chan good morning. Chan asks, why did you wake up so early? Wj asks, are you all prepared? Did you pack everything? 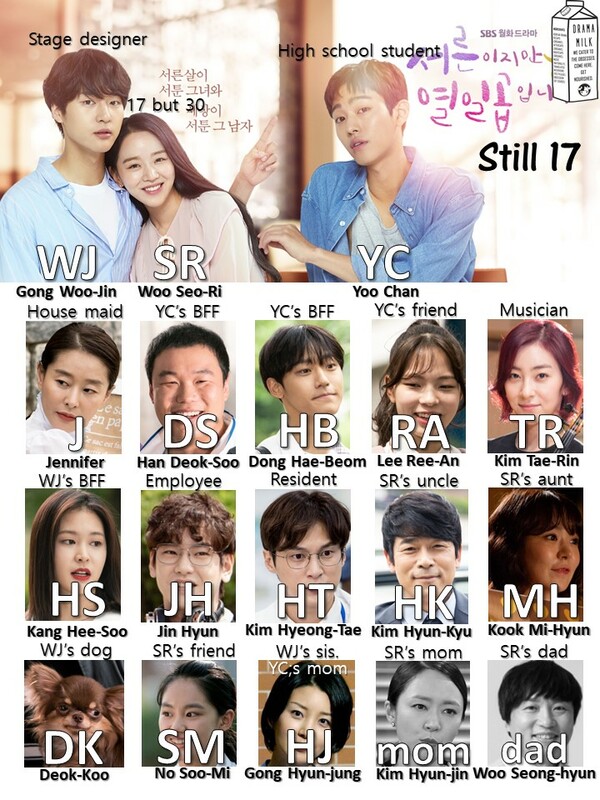 Chan is all like, are you Gong….Hyun-jung (my mom)? Seori calls at that moment and explains that they are still under high wave alert. But she has a meeting at 11:30! Wojin rushes out of the house to go to the meeting. Jennifer is outside and asks if she can use her vacation tomorrow (robot way). he says yes. She predicts that he will fall and he does, lol. Later on, Chan practices rowing and then rests with his friends. He notices a litte boy playing and thinks that it is dangerous over there. But then his friends talk about how someone is dating an older woman that is 11 years older. This distracts Chan as he turns to his friends. But then they hear a splash, Chan runs and hops into the water to rescue the little boy. Cut to the emergency team coming. Chan tells them that he did CPR and the boy spit out all the water. But the emergency team tells him to hop in and explain on the way. A woman says that it is a flower shop persons son. They go to the hospital. The boy is okay at the hospital but is sleeping. The mom shows up and runs to his side. (This might be the aunt!). Only Woojin and Jin Hyun are at work. Woojin thinks that it is already 6pm! But Jh tells him that it is not 6, his watch must be broken and he is also super wierd today. he is usually weird, but today he is super weird. Woojin leaves. A student asks him what time it is, her phone is dead. He is all like, why is it just 6:30pm. the student is all like, why is this guy weird. She walks away. But then someone yells Ajusshi! Ajusshi! Ajusshi! He thinks it is the student and tells her that it is 6:30pm. But then he sees that it is Seori. They run to meet on the bridge cross walk. he asks how she is back now? Seori says that she missed him so she is back. She missed all of them! She wanted to come back quickly! Woojin thinks back to his sister telling him that he likes that woman, right? he says that he thinks it is right. Seori wonders what he is talking about. then tells him that she is tired, lets go. She walks away happily, but looks a little bit flustered. Chan also finds out from Hee-soo that they are back in Seoul. She asks him if his nose is okay. Seori tried to add his buttons and head butted him. Chan tells him that he didn’t say anything about it, he is okay. then he happily calls Jennifer and asks her if Ajumma is there. Jennider is not there, she won’t be there tomorrow either because she is on vacation. Chan is all like, okay…I will call Mr. Gong. But wait a second, Jennifer comes home tomorrow so the two of them…only…. Cut to Seori and Woojin getting home happily. Seori happily greets Dukgu and then calls for jennifer and then Chan. But Woojin tells her that they are both gone. jennifer will be back tomorrow. They both realize that they are in the house alone. It is so awkward. Seori mentions that there is a bug sound (a cicada), he says they have that sound….he tells her that he will go upstairs, but he says it soooo formally (I bid you adieu). She says she will go to her stair room. They awkwardly leave with Woojin bowing to her several times as he goes upstairs. Seori finally gets inside her stair room and wonders why she is so flustered. Woojin goes to his room and wonders why he said goodbye so formally. Elsewhere, Chan is running for excercise and remembers when he called His grandfather. He wonders if his grandfather will take care of the house if Gong is not there. Grandfather told him that his uncle will stop traveling. then he remembers when Gong was happy in the room as he took off his shirt (remembering the button). Chan runs himself ragged as all these thoughts race through his head. back at the house, Seori and Woojin try to drink some water, but it is uncomfortable. But They suddenly notice a moth. Seori screams and Woojin tries to get it out. he turns off the light and says that it will leave naturally like this. But that makes the mood a bit magical. She says that it might have left, but he tells her that they should stay like this a little bit longer. So they both stand like that in the dark as the weight of both their feelings fills the room. Seori slowly turns to look at Woojin and he also turns to look at her. But then the moth shows back up and startles Seori. She is about to fall but he grabs her and pulls he into him. their magical moment continues. Okay, I don’t think they kissed because the preview makes it seem like they didn’t. I love that magical moment, though! Our weekday recaps will all start at 9am CST due to morning engagements. Our weekend recaps will still be live-live! SR – Hello, I am Woo Seori. Old Man – It is okay, you came so it is okay. Text: Woojin, you have a ten o’clock appointment. Friend – Samchon, Chan passed out! WJ – What if you break your nose. SR – It reminds me of a friend that says the same thing. SR – Everyone will say I look like a violinist, right?….why are you looking at me like that? Wj – Because you are pretty. Only two episodes this week! It’s so hard to wait until next week now. I hope the they won’t be cut out of the schedule like this again. Such a good show! Hopefully we won’t have any more postponements. I’m not sure how long the Asian Games last, though. 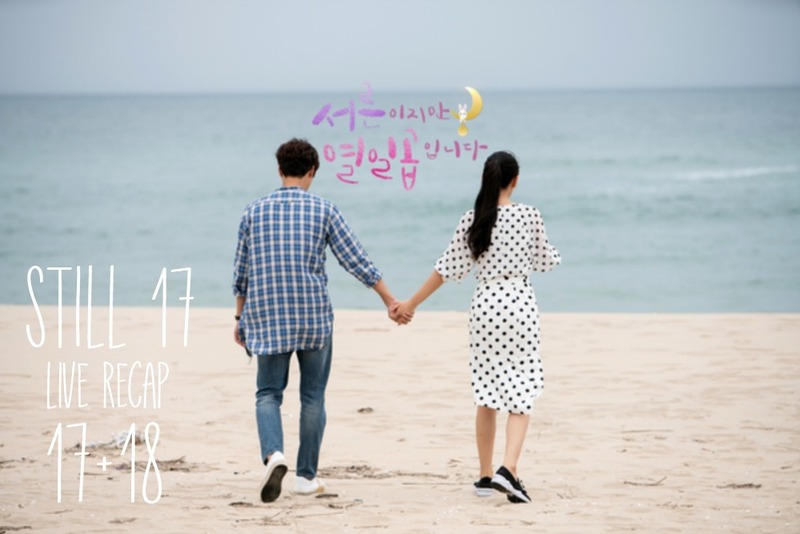 Someone posted on Soompi that episode 19/20 will air Monday rather than Tuesday. And that seems to beg the question of whether there will be a Tuesday episode or (I’m guessing) not. Grrrr! I understand that sport is important, too, but there should be a way to air both sport and drama without one making a hash of the other. Oh that is good to know! Thank you! I am glad Chan figured out now. Even though he is in denial. Atleast, he is not clueless till the end. Am I the only one thats annoyed that the show is trying to tie everyone to ‘fate’ and ‘one incident’. Like, even the sister is somehow related to the past? Am watching it for the 3 main leads. They are fun!